Halloween party ideas for teenagers are not always easy to come up with for this group of typically hard to please kids. The teens aren't really kids, but they're not quite adults yet either, so finding party ideas that will please the teens and the parents can be hard work. If the idea of planning a Halloween party for teens is making the hair on the back of your neck stand up, never fear - there are plenty of party ideas that offer just the right mix of chills and thrills for the teen crowd. One way to make sure the night runs like clockwork is to have a good set of party activities planned. Show your teenage guests a good time with these creative party ideas. Costume contests are Halloween party staples, and they're great for teen parties. Let the kids vote for their favorite costume, or have different categories for the competition so that you have a few different winners. Of course, make sure you have some prizes on hand for the best Halloween costume winners. Sometimes, all a group of teenagers wants to do is hang out together and watch a movie. You can give your movie night a party feel by decorating a "theater" in your home - a special viewing area stocked with comfy seats and lots of snacks. 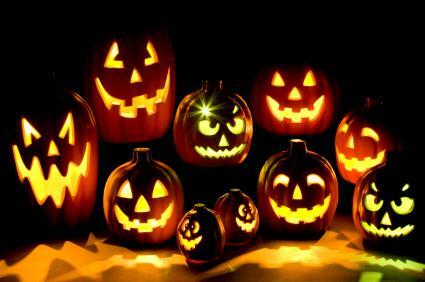 Have a good selection of scary movies on hand; bring new favorites and classic scary movie fare. Teens can often like to show their creativity. Why not let them carve a pumpkin? Make it a group project and have several on hand for the teens to carve. They can be the judge of whose is best and put the pumpkins on display for all to see. People of all ages can enjoy playing games. Many teens can spend hours playing video games. Have several on hand to pass the time and keep the kids entertained. The best ones for Halloween are horror games that the teens will get spooked while playing. If your neighbors or other parents are willing to lend a hand, teens love haunted houses. Set up an area of your home as a haunted house. You don't need much more than dim lighting, a spooky soundtrack and a few good sports willing to don a costume and jump out at unsuspecting teens. Of course, keep in mind that teens are often "anti-activity," so one of the best Halloween party ideas for teenagers might be to just clear out a space where they can talk, listen to music, dance and hang out. Halloween candy, sodas, a couple of pizzas, and lots of space between parents and kids is enough to make any teen Halloween fest a hit. For a special touch light up a pumpkin, add some black and orange candles, string some party lights and you have set the stage for a great night of fun. Halloween is one of those tricky holidays for teens. They're a little too old to be hitting the streets trick or treating, but they've got an itch to do something fun that night. Temptation can be high to revert to the "trick" part of the holiday, since treats aren't so forthcoming anymore. Since Halloween is potentially one of the biggest nights of the year for teen trouble, keep them busy at a fun party that will keep them entertained while staying out of trouble. Clearly set the ground rules with your teen up front. An open door policy can get out of hand fast - know who is on the guest list and give your teen a set number of guests to invite. Have a start time and an end time for the party. Be aware that allowing underage kids to drink in your house is a crime punishable by jail time in most areas. Even if you generally allow your child to drink at home, and even if all the parents say it's fine - don't do it. You can also be held accountable for kids who drink in your home even without your knowledge, so keep a watchful eye out. Most teens want to be treated like adults rather than kids. You can put a grown-up twist on your party to make it appealing to teens. Use simple decorations to set the mood and have plenty of activities on hand to keep the teens entertained while staying out of trouble. Be sure to stay close by and make sure that the gathering is well supervised at all times.